Background: Se-based chalcogenide glasses have wide commercial applications such as switching, optical memory devices and xerography because of their behaviour as phase change material. Thermal characterisation behaviour of bulk chalcogenide glass In4Se84S12 has been studied by Differential Scanning Calorimetry (DSC) under nonisothermal conditions at four different heating rates 5°C/min, 10°C/min, 15°C/min and 20°C/min. The glass transition temperature (Tg), crystallisation temperature (Tc) and melting temperature (Tm) have been determined through DSC thermograms. Method: The activation energy for structural relaxation (ΔEt) is determined by Moynihan method. The activation energy of crystallization (ΔEc) is estimated by Kissinger and Ozawa equations under non-isothermal condition and order parameter (n) by using Johnson–Mehl– Arvami (JMA) model. Surface morphological analysis of thin film has been carried out by Scanning Electron Microscope (SEM) which depicts the development of grains. 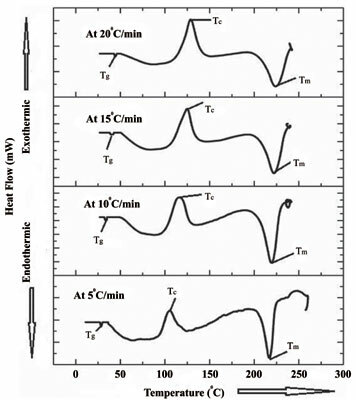 Results: Energy Dispersive Analysis by X-ray (EDX) analysis shows the perfect compositional elements in the alloy. X-ray Diffraction (XRD) of alloy sample has no sharp peaks which reflects that the alloy is amorphous. Conclusion: Based on thermal analysis, it is found that chalcogenide glass In4Se84S12 is thermally stable at 20°C /min and can be used in various solid state devices. DSC, chalcogenide, crystallisation, thin film, phase change, thermal processes.